Serving the fastener industry for over 10 years. 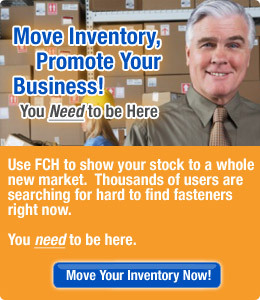 List your inventory with FCH TODAY! We've redesigned our membership levels to ensure FCH offers a program that's just right for your business. Whether you need to advertise a few slow movers, or you're actively growing your business with online sales as a key strategy, our goal is to deliver value to each and every FCH member with a program suited to your requirements. FCH provides an array of benefits designed to help you sell inventory online, expand your customer list, drive users to your website, and raise visibility of your company in your area of expertise. Fastener & Metal Products Corp.